Specialty goats milk cheeses comes from fresh goats milk. Our goats milk comes from our happy goats. Yes, only happy goats produce the best quality of milk. We feed them with green napier grass, different variety of legumes such as Madre cacao, ipil-ipil and mulberry. When you take a bite of our goat milk cheese, you will taste the aroma in our soft crumbly cube cheese, soaked in extra virgin olive oil, with fresh garlic and herbs, you feel the freshness of the pasture we feed to our goats, all packed in gold cap elegant round jar. Making it a perfect gift. 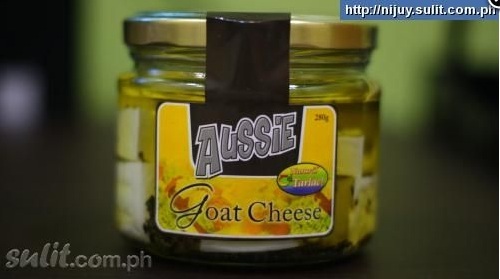 Our own variety of Filipino history and tradition of white cheese. Kesong puti will remind you of an early morning breakfast and snacks accompanied with a piece of freshly baked Filipino bread called HOT PANDESAL. It has a soft texture and slightly salty in taste that completes your hearty meal.